Ever been in a conversation and heard someone drop the phrase “digital transformation”? You may have heard it and thought, “Beautiful. There’s the new buzzword.” But digital transformation is much more. It’s something we all need to pay attention to, because it’s disrupting traditional business models and reshaping our future. Your business will either adapt and embrace the new reality of the digital revolution or collapse under pressure from smarter and more efficient competitors who ride the technological wave to success. Take Uber, for example, which rode the wave and disrupted the taxi industry by connecting users to a network of drivers through smartphones. Uber took advantage of the cloud, location data, and user ratings to get people where they want to go, faster and cheaper. Drivers and riders both benefit from reduced wait times, optimized routes, shared rides, and instant cashless transactions. The result? Ask a millennial how often they use a taxi. Of course, that’s just one of thousands of examples that have become regular parts of our lives, including Google, Amazon, Facebook, and the iPhone. As customers come to expect greater convenience, the pressure to innovate will only grow. Every industry will become increasingly competitive as barriers to entry lower. We are now diving head first into the information age and the digital revolution. As leaders, we need to prepare by re-envisioning our businesses and transforming them to fit the new digital world. Digital transformation refers neither to a process nor to a specific technology. The term represents the convergence at scale of smart and connected devices, cloud computing, real-time data analysis, and artificial intelligence to improve end-user scenarios, business decision-making, and processes. 1. 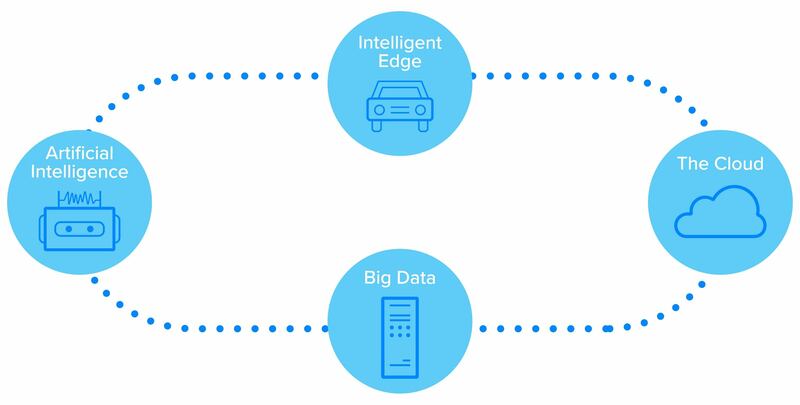 The Intelligent Edge / Internet of Things (IoT) includes the portable devices and connected objects in our world that link to the cloud. Think consumer products like smartphones, Fitbits, and connected cars, as well as commercial IoT devices. 2. The Cloud is a virtual grid of physical data centers that are all connected in a network effect, making all cloud data accessible. Examples include Amazon Web Services and Microsoft Azure. 3. Big Data refers to the ability to store, search, analyze, and share an enormous amount of information collected from our activities, which are now tracked digitally. Oracle and Teradata are industry leaders. 4. Artificial Intelligence (AI) enables machines not only to analyze data but to learn from it and thereby provide better outputs over time. Examples include IBM Watson, Microsoft Cortana, Apple Siri, and Amazon Alexa. As the world’s most innovative brands pull together new technologies to work smarter and find better solutions to problems, key trends will continue to emerge. Keep your eyes open for ways to capitalize on these trends, and you could find yourself riding your own digital transformation wave. It will be increasingly easier and faster for businesses to deliver what customers want, when customers want it. If you are an Amazon Prime member, the Alexa-enabled device in your home takes zero clicks to get that gallon of milk to your door the same day. With even less friction, Amazon Key allows a package (or service) to be delivered inside your home, without you being there. In many scenarios, purchases can be made directly through Facebook or Twitter. Technologies like Apple Pay have made retail transactions much quicker. Apple’s Face ID allows facial recognition, not only for unlocking your device, but also for making transactions. Shoppers in brick-and-mortar stores compare products and prices on their smartphones in real time and ultimately purchase from whichever store and channel meets their needs including price, features, availability, or service. To stay ahead, businesses need to optimize the entire customer journey from awareness and desire to assessment, acquisition, service, and loyalty – and they need to do it across both their physical, digital, and social channels. Reducing the time and effort required for customers to get what they want is paramount. For business, the capacity for an enormous number of consumers to share their opinions, preferences, and activities over social media drives incredible value potential and opportunity. Over time, this factor can reduce the need for brands to prove to consumers the value of their products or services. For example, Yelp can tip you off to which restaurants in your area serve the best Thai food, based, not on one article or ad, but on the feedback of many. Similarly, Angie’s List organizes independent customer reviews on services ranging from local roofers to dentists. Businesses also take advantage of social platforms for recruiting, customer care, product feedback, customer community programs, and internal collaboration. Companies need to embrace and leverage the power of social networks in engaging with customers and employees – it’s already here, and it’s definitely the future. The threat of new competitors in your market is higher than ever. Technology is improving at an ever-accelerating rate – and the cloud has reduced the initial investment required to store and use data. Crowdsourcing (a good example of digital transformation in early-stage funding) has provided entrepreneurs increased access to capital. Social networks have also created a platform by which products and services with consumer appeal can reach the masses without million-dollar marketing budgets. Firms will need effective means to assess their market, understand their differentiation, develop a competitive strategy, execute, collect customer feedback, derive insights, and regularly repeat the process. Plan for increasing competition in your market, and focus on bringing differentiated value to your customers. Society is changing, and the choice for connectedness and convenience is taking priority over privacy. Just ask the more than two billion users on Facebook (most of whom are older than millennials). When you opt in to use that new app, the company publishing the app is likely storing information about your everyday life, including consumer preferences, community engagement, and societal perspective. It’s all being cataloged and analyzed to make predictions and create personalized offers. For your firm to keep up, you’ll need to be on the lookout for ways to collect and store this data securely, and then to use it to improve customer experience and conversion rates. But, customer privacy will remain crucial. Keep in mind that the more data you possess, the more interest there will be in accessing it – with or without your permission. making informed decisions based on customer data at scale. Businesses that fail to adapt will in time collapse. Those that remain agile and customer focused can embrace the opportunity presented by digital transformation and find a path to sustained success. Ezra is a director at Bridge Partners who partners with clients to develop comprehensive competitive strategies, create market wins, build operational frameworks, and drive implementations.